In these days of increasingly short attention spans, a year-long commitment can seem like a daunting task. So, how does 40 sound? In Aurora’s case, there are a number of residents for whom the prospect of giving a decade or four to a cause that’s worthwhile causes barely a bead of sweat to roll down their forehead. Over 345 years of community contributions were recognized by the Town of Aurora this year as the Community Recognition Awards honoured residents for 20, 30, 35, and 40 years of volunteerism. When Trevor Stephens first put on his scouting uniform growing up in Aurora, he might have done so to learn a few knots, meet some new friends and bring home some new skills. He probably didn’t realise it would set him on a five-decade journey, but it did – and now he has the certificate to prove it. 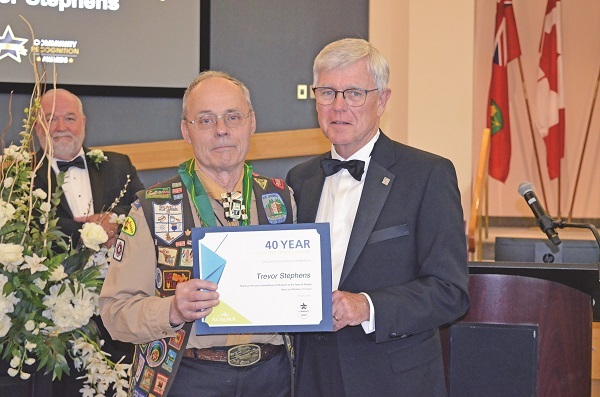 “The First and Third Aurora Scouting Group would like to recognize Trevor Stephens for his 40 years of volunteer service,” said event emcee Brian North, reading Mr. Stephens’ citation. “Trevor is a man who is dedicated to not just the community he grew up in and returned to, but also to helping others. Trevor learned to love scouting in his youth. While being in the military, he established scout units in every base that did not have scouting and served as a cub master on the base. Also recognized with 40 Year Volunteer Service Awards were Lois Thompson and Paul G. Anderson. The Aurora Diggers Girls Softball would like to recognize Lois Thompson for her 40 years of dedicated service to the girls’ softball league. Lois has been dedicated to volunteering and leading girls’ softball in Aurora. For her countless roles she has taken on to ensure each season was a successful one, and that the girls had an experience that they will keep with them for decades to follow. Lois can also be counted on and depended on, even when it rains or is extremely hot, she ensures the game goes on. The Royal Canadian Legion Branch 385 would like to congratulate Paul G. Anderson for his outstanding 40 years of service. Paul Anderson has been an active member of the colour party and assists with set ups and teardowns of countless special events that are held at the Legion annually. Paul is also a dedicated participant for the Legion’s annual Poppy campaigns. When it comes to volunteering, Paul is one of the first to say yes and has never broken his promise. He is a long-time member of Aurora United Church where he continuously makes himself available to assist when needed. Paul’s volunteering work with the Legion and the United Church, as well as other groups, through commitments, goes well above and beyond his commitment to volunteering to the community. Recognized for his 35 and 30 years of community service respectively were Robert Kennedy and Ross Haagsma. The Second Aurora Scouts would like to recognize Robert Kennedy for his 35 years in volunteer service. Robert has taken on a variety of roles, including Beaver leader, Cub leader and most recently as group commissioner for the Second Aurora Scout group where he has been instrumental in the growth of the group. Robert also shows additional dedication to the scouting movement by assisting at Scouts Canada’s Halliburton camp and the local scouts Adventureland camp near Ballantrae. It is volunteers like Robert who make this community a great place to live. The Second Aurora Scouts Group would like to recognize Ross Haagsma for his 30 years service to Scouts Canada. Ross has been a section leader in Cubs, Scouts and Ventures and is presently the group commissioners. The Fifth Aurora Scouting Group is very appreciative of Ross’s involvement and dedication. A bumper crop of volunteers were recognized for their commendable 20 years of volunteer service to community organizations, and perhaps this is appropriate as six out of the seven recipients were recognized for their dedication to the Aurora Community Arboretum. Receiving their awards for 20 Years of Service were Gord Barnes, Mike Bender, Irene Clement, John Clement, Karen Fulbrook, Keith Saunders, and Brian Walsh. Gordon Barnes has dedicated so much of his personal time and energy to the Aurora Community Arboretum. Without his love for nature and for our Town of Aurora, the Arboretum would not be the beautiful centrepiece it is today. Mike Bender is another dedicated volunteer for the Aurora Community Arboretum. Mike is a husband, father and works full time yet manages to give so much of himself to the Arboretum. The Board relies heavily on the expertise Mike brings to the table. Irene works tirelessly as chair of the Board of Directors, spending many hours on the business side of things. She liaises with the Parks Department and oversees everything to do with the Arboretum. As well, you will find Irene out planting trees and shrubs during the work days. John can always be counted on to do whatever needs to be done to ensure that hundreds of shrubs and trees are planted every year and are cared for afterwards. He dedicates a lot of hours and a lot of energy to accomplish this. Karen works fulltime as a teacher and is able to bring her experience in the classroom to the Arboretum by arranging activities for children. Karen is able to make learning fun. Keith has been the treasurer of the Arboretum almost since its inception. Although Keith works fulltime, his financial reports are always ready for the monthly board meetings. He dedicates many hours and lots of energy to accomplish this. Brian Walsh is past president of the Aurora Optimist Club and has sat on the Board for a number of years. He regularly attends and participates in their monthly meetings. He is active in their policy review and development activities and assists with the Optimists mobile kitchen when they are serving food at community events. Next year, he will have the position of club treasurer and, following that, will serve a second term as president. He is truly a valued member of the Optimist Club of Aurora.